What’s the Deal with Flat Earthers? Conspiracy theories are a favourite past time of mine. I love to read about them and often join Facebook groups or trawl forums full of people that believe them. It’s fascinating to me that someone can propose an idea that relies on a huge network of lies and cover-ups only to have hundreds or even thousands of people decide to agree. Well, sometimes the arguments are convincing!! But never THAT convincing!! I say “decide” because surely it’s a conscious decision to take something you have always accepted as truth and discard it in favour of something that seems far-fetched to most of us. Case in point: Flat Earthers. For the uninitiated, Flat Earthers literally believe that the Earth is not the globe that all those pesky satellite pictures would have you believe. It is, in fact, flat. There are a lot of them out there but most have some kind of point, something that motivates the conspirators. There is a common belief, for example, that pharma companies hold the cure for diseases like cancer but won’t release them. 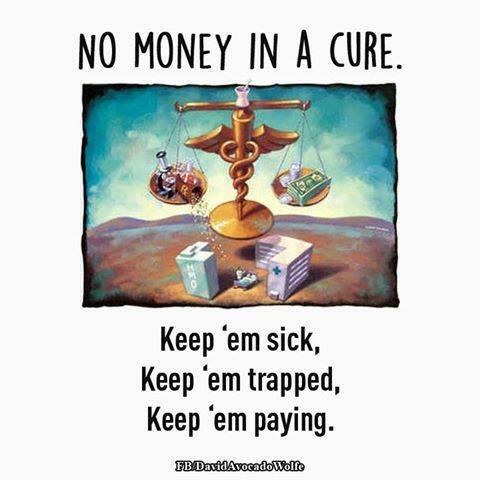 The belief being that they make more money from treatments than the would from cures. We know this isn’t the case (read more here, here and also here) and yet, the David Fraudacado Wolfe meme factory (and others) persist. The Moon Landing Conspiracy is another one that has a point. The Americans simply hired Stanley Kubrick and set the scene in Hollywood (or Area 51, depending on which story you choose to believe) and faked the whole thing. Why? To beat Russia in the space race. There’s the motivation, no matter how far-fetched. Another example is the dead celeb bait-and-switch. Just recently, there were reports of a conspiracy where singer Avril Lavigne had died 10+ years ago, to be replaced by a lookalike. Even further back is the belief that Paul McCartney, of the Beatles, was killed in 1966. He was allegedly replaced with a lookalike as well, whom conspiracy believers have dubbed “Faul”- for Fake Paul. The motivation? So that agents, record companies, band members and whoever else profits off the work of a musician can continue to do so. A Flat Earth- Who Gains What? Who gains something by lying to the people about the shape of the planet? Is there really that much profit in selling globes to schools and to people who want fancy desk ornaments? What benefit is there to anyone at all in tricking the entire world about the shape of the entire world? I’ve joined some groups and done some reading because this is just one aspect I have trouble understanding. Some believe we are surrounded by an ice wall and that there are lands beyond it, which is pretty Game of Thronesy to me. Others think there is a dome over us which stops us falling off the edge. Remember that scene in The Trueman Show, where he sails into the wall? Some believe that it’s all to do with the Illuminati (think Dan Brown novels/films) and others are convinced it’s a Jewish conspiracy! I have read discussions about NASA and governments being involved in the worship of demon gods and that getting people to believe the world is round is all a trick to ensure we won’t be allowed entry into heaven. There are small offshoots of Christianity that believe the earth is flat. They use certain biblical verses to justify their position, including mention of “the four corners of the earth” which is not, apparently, a figure of speech. I’m not going to list them all but here is a post detailing 60 verses in the bible that apparently support the notion that the earth is flat and inside a dome. The dome idea as reality was a new one for me. Being an avid Stephen King fan, I found it a little too close to fiction and again a difficult point of view to understand in terms of motivation. There are “documentaries” on YouTube, “exposing” evidence of the dome over us all. Really,. In a particular Flat Earthers group I am in, the discussion centres on interpretations of what was said in the bible. It’s probably pretty accurate to say that some people who wrote the bible assumed or believed the earth was flat- even though there is record of the earth being believed to be round as early as 6 BC. That doesn’t mean they were right. These same people wrote all manner of gory and unthinkable things that God apparently wanted humans to do that modern Christians do not follow- you know, because they’re reasonable human beings. It’s not only Christian literature that has spoken on earth as flat- the Islamic Quran apparently holds similar teachings- but again, it holds other views and practices that many modern Muslims do not follow for the same reasons as the Christians. Buddhism and Hinduism have similar theories way back when; but surely it’s easy to see we’ve learned more and more since these ancient texts were devised? Who would have to be in on it? Everyone who has anything to do with space travel or exploration. All those that work with satellites. Scientific bodies, governments and more. When you start thinking about the scale of this conspiracy, it becomes even more difficult to believe. I saw a meme that said that for the moon landing to have been faked, 400,000 people would have had to be in on it. In this Flat Earthers group, a man stated that wasn’t true. That the true number of people involved was 12. And that was all it took to convince the whole world. However, when I looked into it, I found a study titled “On the Viability of Conspiratorial Beliefs” and it would seem that the figure of 400,000 is spot on and that the fakery wouldn’t have lasted more than 4 years. But sharing that would be pointless- no one would believe it. Just a handful of people to fool the whole world?? In all I’ve read, it seems that the motivation for believers is in the challenging, or simple rejection, of the scientific consensus. It makes people feel special to believe they know something that other people are perhaps too blinded or stupid to see. It’s easy to write off Flat Earthers with the Dunning-Krueger effect, where people believe, essentially, that they have higher intelligence and ability than they actually do. But there are highly intelligent people in these circles. Professionals, doctors and more. Educated minds. Is it just the lure of being different, misunderstood, an outlier? Perhaps it’s a rebellious streak? Or is it simple arrogance? I don’t have the ability to unravel this. In fact, lots of super smart people have trouble getting through to and understanding conspiracy theorists. The governments keep the population duped by their own version of science which makes it easy to sneak other things by us. It’s really an experiment to see who questions that status quo and who doesn’t. The “sheeple” become obviously separated from the “superior” minds in the herd. NASA (whether it is a demon worship cult or not) gets lots of funding when all it really does is fake images and possibly project stars etc into the sky. All those funds are used for something else that is undoubtedly nefarious. This is a big part of the human experience. We don’t like things that make our opinions and belief sit uncomfortably. One cannot believe the earth is flat while accepting that some people have been into space. We can’t accept satellite images showing the globe. If we truly want to believe that the earth is flat, we have to discount all evidence to the contrary. Then we must find a rationale that explains it. The explanation, then, is that it’s all a big lie. The earth isn’t round, gravity doesn’t exist (a common belief among Flat Earthers), NASA are Satanists, satellites aren’t real and the government is against us all. Which brings me back to the same question- why? I’m no scientist, but I am following my current Flat Earthers group with interest. People are losing friends and contact with family over this belief. It’s spoken about like a lifestyle change- think “I’ve been FE for 4 months now and…” type posts. Many have expressed disillusionment with their churches. Studies and evidence are met with a collective scorn. Although there is no unified belief on the hows and whys, there seems to be a certain kinship in the “martyrdom” of recounting what your belief has cost you. I wonder if that solidarity in suffering is part of the attraction? I feel like I’ve read an awful lot on Flat Earthers and come out the other side not much wiser. If you have any thoughts on this belief, I’d love to hear them! Do We Really Need Ways To Drink More? Never miss a post- get HandbagMafia straight to your inbox!